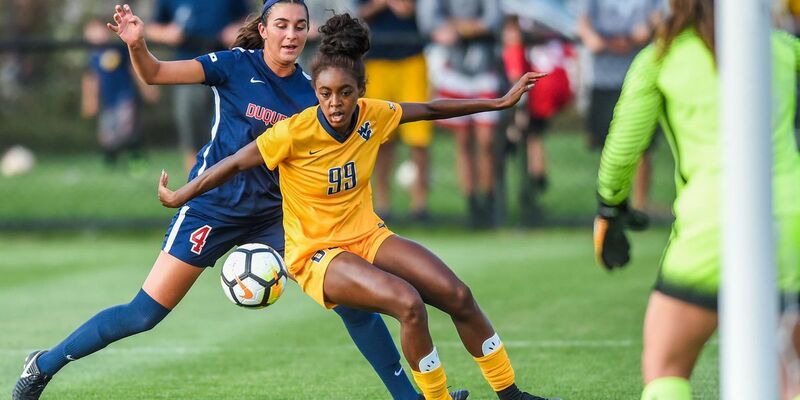 Former Richmond Hill High School soccer star, Sh’Nia Gordon, just inked her first professional contract. RICHMOND HILL, GA (WTOC) - Former Richmond Hill High School soccer star, Sh’Nia Gordon, just inked her first professional contract on Tuesday. Gordon will be suiting up for FC Metz, a member of Ligue 1, the top level of French professional soccer. Gordon was a four-year starter at West Virginia University. She started in 95 matches, setting the program record for starts her senior season. She’s also tied for number one in career matches played as a Mountaineer. She led her team in 2018 with 20 points (nine goals, two assists). That goal-total ranked fifth overall in the Big 12 Conference. The forward finished out her senior year ranked number one on the team, third in the Big 12 and 60th nationally with four game-winning goals. In her career, Gordon tallied 25 goals and 15 assists for a team-best 65 career points, per the press release. Gordon is a United Soccer Coaches All-Midwest Region First Team honoree, All-Big 12 First Team in 2018 and Big 12 Championship Most Outstanding Offensive Player. In 2016, she was named to the NCAA College Cup All-Tournament Team and was on the 2015 All-Big 12 Freshman Team. A finance major, Gordon was an Academic All-Big 12 honoree, a member of the Big 12 Commissioner’s Honor Roll and the Garrett Ford Academic Honor Roll according to WVU. As a senior at Richmond Hill, she scored a school-record 59 goals for the Wildcats.